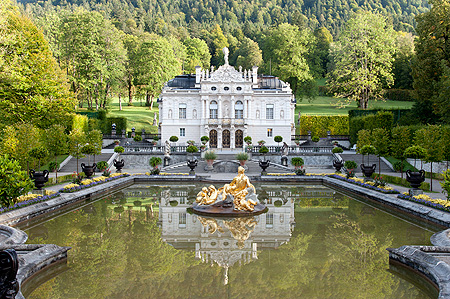 Linderhof Palace and its surrounding park is one of the most artistic and stylistically complex ensembles of the 19th century. The "Royal Villa" is the only palace King Ludwig II of Bavaria (1845–1886) was able to complete (1878). It is influenced by French architecture and modelled on the small summer palaces, usually set in parkland, that were built in France in the 18th century and were also often to be found in Germany in the parks of larger palaces. Behind the Baroque façade is a Rococo world with motifs from the age of Louis XV of France. 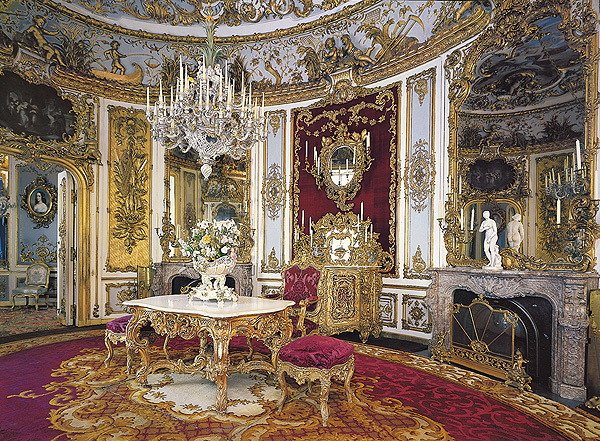 Ludwig’s creation in the Second Rococo or Neo-Rococo style, however, shows a strong South German influence: Ludwig took over a great deal from the Rococo legacy of his own ancestors with which he was familiar from his childhood, such as the Amalienburg in Nymphenburg and the Ornate Rooms of the Munich Residence. Linderhof Palace has a checkout and reservation system that assigns visitors fixed entry times and guided tours of the palace. Tickets can be reserved online, by e-mail, post or fax for an additional prepaid charge.